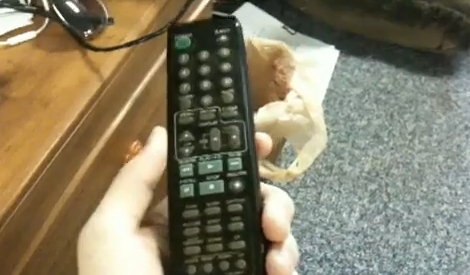 [Matt] brought together a TV remote and cordless phone to add a locator system to the remote control. One of the best features of a cordless phone is the pager button on the base. When you press it the handset beeps until found. Matt gutted one and got rid of the unnecessary parts. He then cracked open his TV remote housing and inserted the telephone handset’s circuit board, speaker, and battery. The base station is used just like normal to locate the phone/remote combo, and has been modified with a charging cable to top-off the telephone battery which powers everything in the newly hacked unit. [Matt’s] demonstration video is embedded after the break. It’s too bad that he got rid of the microphone. It would be interesting to take calls on this thing. Would have been nicer if he had used the original contacts for charging, instead of of the plug in wire. A small NC switch could power cycle the remote in order to silence the pager. Good hack none the less. How difficult would it be to craft a single board from both the remote and the phone? Using the phone cradle to charge a remote/phone would just be nice. Phone in remote-> interesting idea. Remote in phone-> terrible idea. I don’t think “Phone in remote” is an interesting idea because the odds you will have a cell phone in your pocket or immediately nearby are extremely high. I don’t see the advantage. But then again, I haven’t had a landline phone in years. Perhaps someone could mod an iPhone/Android with an infrared transmitter? It would be hard to make it look decent, but it could be nice to use your phone as a backup remote. Dr. Tongue, you’ll be happy to know there are multiple apps for that, now. The first TV my wife and I bought togerther (circa 1995) was a Zenith that had that feature built into the remote. There was a “Locate Remote” button on the TV. It helped us on more than a few occasions. They already have existing add-ons for the iPhone that do just that. Unfortunately, since it mounts to the bottom of phone in the charge/data port, you have to hold the phone backwards to use it. @ MB: There is also irRemote for Symbian phones. I used it to control my VCR and a CD player which i could never find remotes for. I just tie mine to the leg of the coffee-table with string. I remember using remote control software some time ago on Palm and Windows Mobile phones. Considering that the IR comms port went the way of the dinosaur in favor of Bluetooth, maybe a Bluetooth-IR adapter would be the way to go for such a project.